Xerox Offers Solutions that Connect the Physical and Digital Worlds at PRINT 17 | Industry Analysts, Inc.
NORWALK, Conn., Sept. 7, 2017 – How can today’s commercial printers bridge the physical and digital worlds through innovative solutions in printing technology, workflow software and personalization? The answers will be on display at the Xerox booth at PRINT 17. Among the products on display in the Xerox booth are three MUST SEE ‘EMS award winners – The Xerox Trivor® 2400 High Fusion Inkjet Press, the Xerox iGen® 5 Press with White Dry Ink and Xerox Specialty Imaging. The annual MUST SEE ‘EMS competition recognizes the most compelling new products being shown at PRINT 17. The Trivor 2400 High Fusion Inkjet Press allows print providers to produce high-quality results direct to offset coated paper without any intermediate paper coatings, primers or specialty hardware. The iGen 5 Press with White Dry Ink enables the application of white on colored or transparent stocks, opening up a new set of application opportunities. Specialty Imaging helps to protect against counterfeiting with exclusive fraud-resistant printed effects, for both static and variable information jobs. The Xerox Brenva® HD Production Inkjet Press: Two new feeding and finishing options have been announced: a Tecnau Roll Feeder and an inline square fold finisher, the CP Bourg PowerSquare 224. These options extend the value of the press and help drive additional efficiencies by delivering hours of uninterrupted print time. Additionally, the press has been updated with two new automated quality control checks to assure maximum uptime. The Xerox Rialto® 900 Inkjet Press: With a new inline dynamic perforator and a second-high capacity stacker, print providers can maximize press availability and expand into new high value application segments. 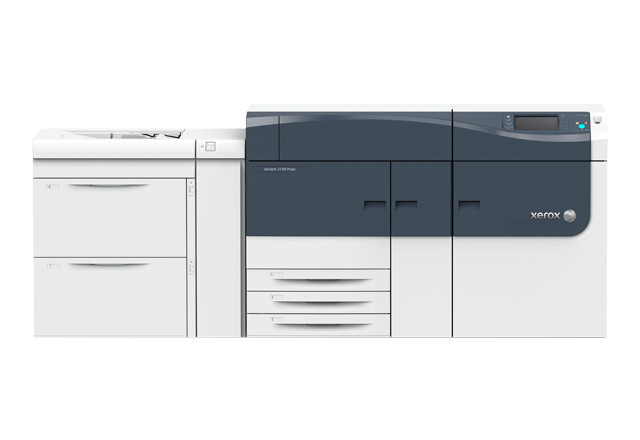 The Xerox Versant 3100 Press: Printing at speeds up to 100 pages per minute on stocks up to 350 gsm, the new Versant 3100 offers high image quality and performance along with advanced inline finishing capabilities. Xerox FreeFlow® Digital Publisher Version 3.0: The solution offers new templates and an updated web reader to provide an intuitive, more consistent reading experience across web browsers and mobile devices. The new article layout templates provide more design choices, while the new web reader enhances the reading experience of documents, back issues, social media sharing and more. With these updates, print service providers have more flexibility to meet demanding requirements of end clients. Personalization solutions: XMPie®, A Xerox Company, will be demonstrating a new VIPP-to-PDF/VT processing capability to its PersonalEffect® suite of software offerings along with Omnichannel A/B, a new capability that applies A/B testing to batch email touchpoints in a multichannel communications campaign. Xerox will be displaying where the physical world meets the digital in booth #1302 at PRINT 17 in Chicago from Sept. 10-14.